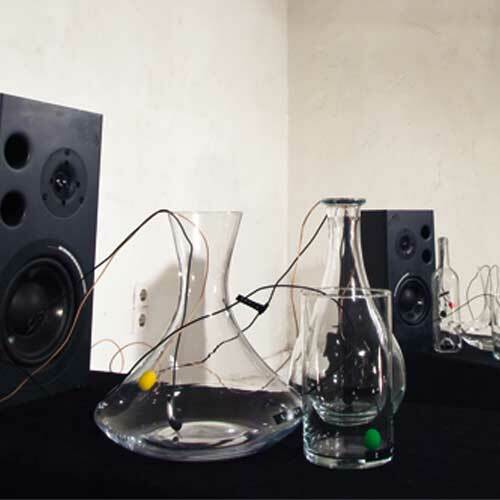 Italian artist Agostino Di Scipio, born in Naples in 1962, uses glass jars and contact microphones to record ambience sounds from an art gallery, with added filtering and EQ, as Di Scipio is also an electroacoustic composer. A few excerpts from the full version of the interview to Agostino Di Scipio by Digicult. His work was represented by the new gallery Mario Mazzoli based in Berlin, one of the first galleries in the international dedicated to sound art. Agostino Di Scipio: For “Private Rooms” I have outlined a network of miniature microphones and headsets (ie, miniature speakers) that, by accumulating background noise from the room environment, could possibly generate sound. Then I spent a long time to implement, empirically, the mutual influence between the various network components, making it to some extent self-regulate over time, and to dynamically change its own process depending on acoustic events in the surrounding space. 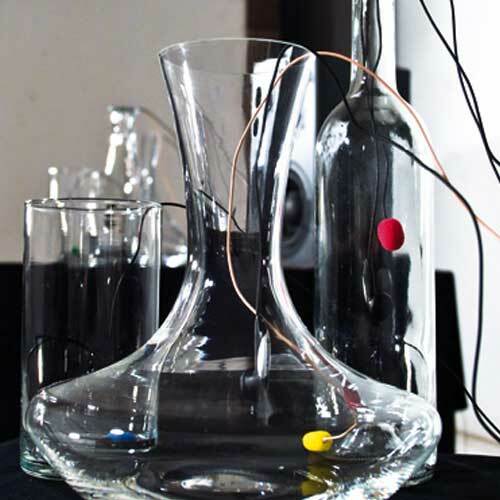 “Stanze Private – Private Rooms” amplifies the noise inside these small rooms, these few jugs and glass ampoules, transparent. And it amplifies the noise in the surrounding environment, in the largest room where the installation is placed. It produces sound from the audience. We as listeners can not only be part of this small ecosystem, our physical presence alters the acoustics of the surrounding space, altering the dynamic. Listening thus interferes on listening, the listening is never something objective, is always something that changes the listening itself. I usually use electroacoustic transducers (microphones of various types, sometimes accelerometers or other) to detect the acoustic reflections of the walls or other niches resonant in a given space. Often I detect sounds reflecting the social function of the surrounding space, but small sounds that are typically removed from our auditory experience – acoustic scraps, sonic garbage. These sounds are analyzed by a computer, with digital signal processing methods, so the computer measures some features of sound, and that information is finally used to drive the process of generation and transformation of the environmental sound itself. At the base, there is a kind of retroactive scheme in which the sound production is at least partially modified by the manner in which the space responds to the very same sounds that are produced: the computer process is rendered space-dependent, adaptive.